MEET THE CANDIDATES – Dane COuntySupervisor TIm Kiefer will moderate the event. Attendees will be able to ask questions to the candidates. 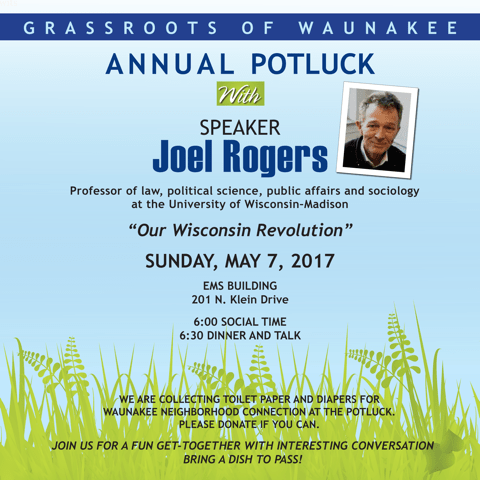 Jot down you questions and bring them and your Waunakee neighbors to the event. $5.00 Room Charge n Dinner on us! 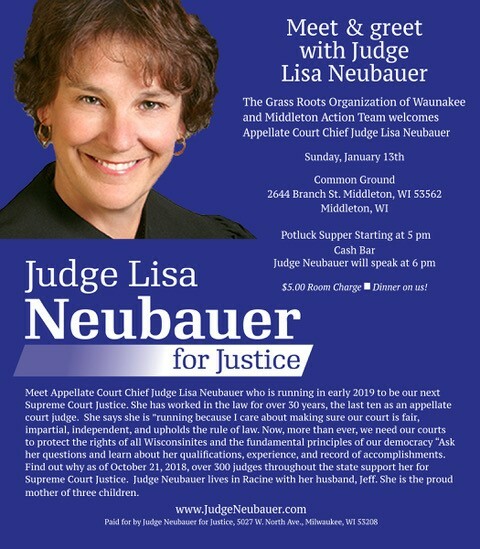 Meet Appellate Court Chief Judge Lisa Neubauer who is running in early 2019 to be our next Supreme Court Justice. She has worked in the law for over 30 years, the last ten as an appellate court judge. She says she is ”running because I care about making sure our court is fair, impartial, independent, and upholds the rule of law. Now, more than ever, we need our courts to protect the rights of all Wisconsinites and the fundamental principles of our democracy “Ask her questions and learn about her qualifications, experience, and record of accomplishments. Find out why as of October 21, 2018, over 300 judges throughout the state support her for Supreme Court Justice. Judge Neubauer lives in Racine with her husband, Jeff. She is the proud mother of three children. U.S. 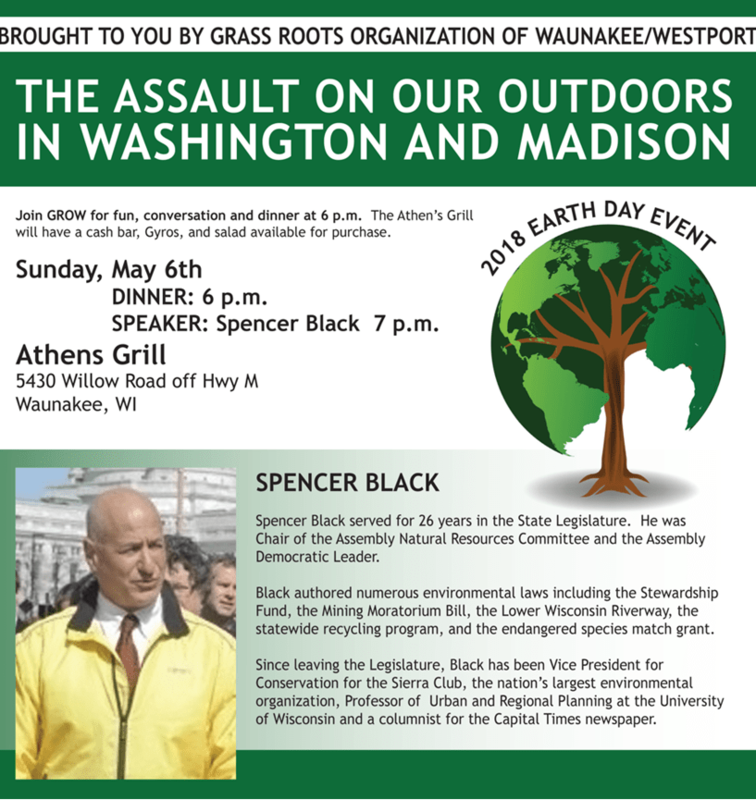 Congressman Mark Pocan will speak at Common Ground 2644 Branch St., Middleton, Corner of Branch at Century Ave.
$5.00 at the door covers room charge and Potluck Dinner on us. GROW and MAT are hosting Mark Pocan on Sunday evening, September 23, to speak about what Congress is doing to promote secure US elections and other issues of interest related to the upcoming midterm elections. Rep. Pocan’s presentation will include opportunity for questions. 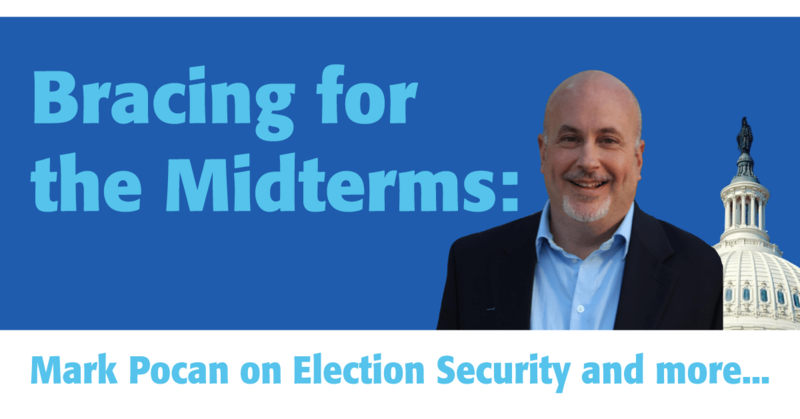 Election security has caught the attention of Congress, and Mark Pocan’s Secure America’s Future Elections Act is one of the best measures that’s been introduced. With 25 cosponsors as of late August, the bill would require paper ballots and routine hand-counted audits in all 50 states, in addition to addressing several other aspects of election security. Dr. Michael Notaro, the Associate Director and Senior Scientist of the University of Wisconsin-Madison Nelson Institute Center for Climatic Research, will be presenting the topic of “Observed and Projected Climate Change in Wisconsin and its Implications.” Dr. Notaro received a PhD in Atmospheric Sciences at the State University of New York at Albany in 2002. His expertise include climate change and its ecological impacts, global and regional climate modeling, and lake-effect snow. Paul Cienfuegos, a Portland, OR, based workshop leader, lecturer, and writer will be giving an introduction to the activist strategy of community rights on Monday, Feb. 27 at the Jefferson Square Clubhouse, 717 DeForest St, DeForest, WI 53532. Community Rights is a national movement of local level cultural and legal strategy for communities, both conservative and progressive. Its purpose is to rein in corporate power and return political power to the people and their communities. The program will begin at 6 PM and will be preceded by a potluck supper at 5:30. If you come to the potluck, please bring a dish to pass. Utensils and beverages will be provided. The DeForest Grassroots group will be accepting donations to defer their cost of bringing Paul to our area.